Last Friday night Molly and I decided it was time for us to start getting together again some evenings to make silly things. 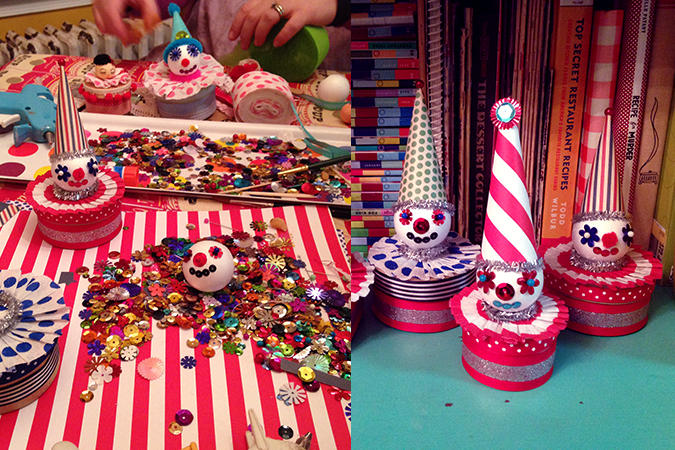 We went out to dinner at a new diner and picked up some craft supplies to make these vintage inspired clown boxes. Molly is working on a tutorial for her blog, so look for that soon! those are SO CUTE! and i didn’t know Molly had a blog! awesome! i keep talking about having a craft night with my best friend. we want to make some of those fake cakes! maybe this year we’ll finally do it. Rae, Yes do it! Fake cakes are on our list too! !